Hello! Yes, I'm still here, just busy busy busy as everyone seems to be these days. 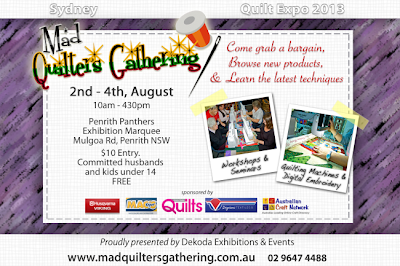 I'm just logging on quickly to let you know that from next Friday 2 August to Sunday 4 August, I will be at the Mad Quilters Gathering at Penrith Panthers. I'll be at Stand 87, surrounded by mountains of my personally-made fabric die-cuts! Now some of you may have heard that Moda has started making hexagon charm packs, but that's not going to stop me making mine! As well as my great range, remember that I can custom-cut whatever you want. I'll be bringing my inchy fabric hexagons, large hexagon charm packs, diamonds and triangles, and for the first time ... my apple-core charm packs! You won't believe how quick and easy these are to sew! 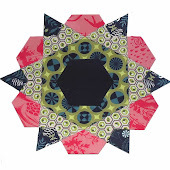 Oh, and I'll be bringing my own brand of die-cut papers for hand-piecing of course, although I can't bring all shapes/sizes with me, so keep in mind that if I don't have what you want on the day I will mail it out to you next week with no charge for postage. Here's the flyer, but if you need more details go to the the Mad Quilters website. They've got a video of last year's Gathering too. Oh my, what's my Google password? It's been a month since I logged on to blog! My better half is now doing Ramsgate Foodies and Artisans Market (Saturdays) and Bondi Junction Village Market (Thursdays) by himself as I work Mon-Fri. Please stop by and say hello to him. As well as my gorgeous vintage-stamp pendants and so on, you will now find Gary's very own (and very wide) range of badges. He's crazy about dogs, so they feature heavily! See you there, wherever that may be! P.S. I've had a problem receiving emails over the past couple of days. I think I've fixed the problem now so if you haven't received a reply, please email me again as I didn't get your email at all. 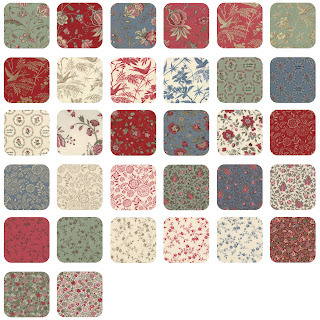 I've just added these layer cakes to my store - Tapestry, Old Glory Gatherings, Flirt, Marmalade and La Belle Fleur. Remember, you can get them die-cut in the shape and size you want (or just the layer cake as is). 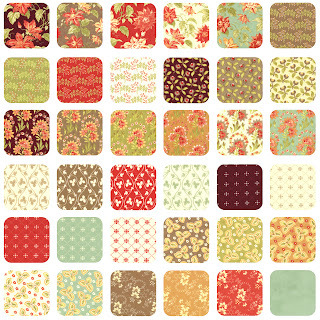 I still have more fabrics to list - Posy, Avalon, Noteworthy, and Boho. I hope to get them listed over the next few days. Maybe you'll find your next project here! Already halfway through the month and I haven't yet blogged. I swear I've been getting LOTS of things done though, really I have! Gary and I have mapped out all the markets we want to try this year, as well as the good ones to repeat from 2012. 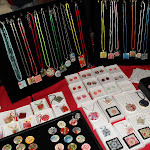 I plan to do some bigger patchwork events, Gary will continue to sell my pendants, and wherever possible we'll take both to the markets. More markets means I have an excuse to make even more pendants. 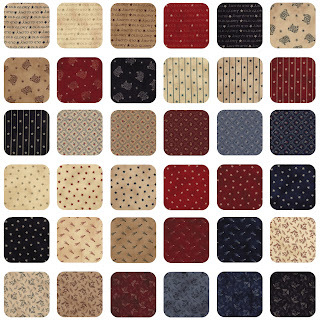 I've been in research and development mode for the past month, thinking about new things to make, as I want to tailor my stock to each market rather than have a one-size-fits-all approach. 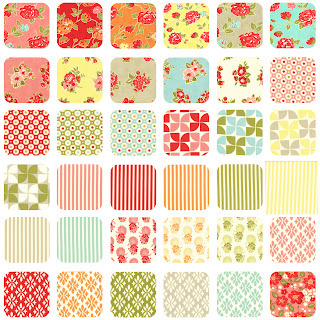 Unfortunately this means that all my patchwork projects are still on hold, although I spent last Monday night making some behind-the-scenes changes to my patchwork store to make it a little easier for shoppers. 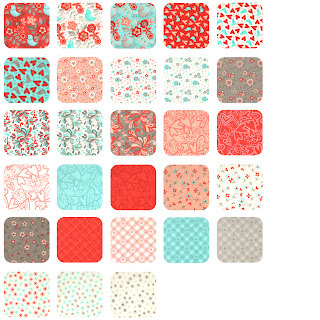 I received lots of new fabric from my supplier in Nov/Dec and was planning to catch up this week and add them to my store, but I picked up a tummy bug. The less said the better. Hopefully I can get back to job-work and craft-work soon. Someone asked me if I could recycle lever arch folders. I said no, I can deconstruct/ repurpose/ recycle all other types of office folders, just not these ones because of the particular materials used. But that started me thinking, and before I knew it I had figured out how to pull apart these ones too, which means both the metal and cardboard can now go into their separate recycling streams. Stop me now! Otherwise I'll be talking about crafty recycling all day. I accept that 99.99999999% of people in this world do not share my passion for recycling office supplies. But some do share my passion for crafty recycling. I recently found a YouTube clip on cutting up soft drink cans, which got me thinking. I put my die-cutter and embosser to good use and I now have a pile of embossed aluminium hearts to craft with. I have ordered some alcohol inks on eBay. They are probably waiting for me in my post office box. I wish I wasn't sick!